Mercedes took its sweet time updating the G-Class, much like Land Rover is in no rush to launch an overhauled Defender. The Tata Motors-owned marque was seen recently in a winter wonderland putting the finishing touches on the next generation of its off-road icon in the long-wheelbase flavor, but we can also catch a glimpse of the two-door SWB variant as well. All the camouflage in the world can’t mask the body’s boxy shape, which fans of the Defender will surely be happy to see it is being retained for the next decade. 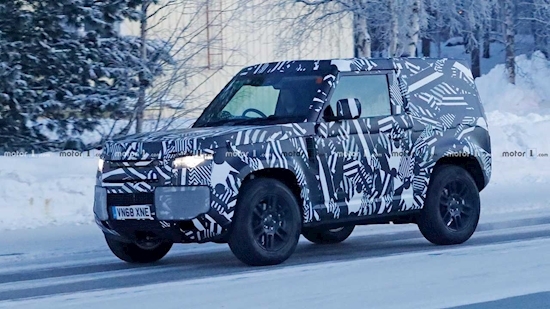 Confirmed for a much-awaited U.S. return, the Defender is not wearing the “BEST 4X4 FAR” decal we saw at the end of last year when prototypes of the SWB and LWB versions were caught out and about. Full-LED lights front and rear denote the next generation will keep up with the times, while the short overhangs are exactly what you’d expect to see from a Defender. While we don’t get to check out what’s going on inside these two prototypes, let’s remember an image with a cabin mockup emerged onto the Internet about a month ago. Bear in mind that didn’t show the final design of the SUV’s interior, but nevertheless, it was a good opportunity to get an idea about the far more modern dashboard compared to the previous, utilitarian look. Technical details are scarce at the moment of writing, but the new Defender will allegedly ride on a car-like platform and is going to boast independent rear suspension. Various body styles are in the works, including soft-tops and pickup truck versions, while the availability of spartan and upscale interiors should broaden the vehicle’s appeal. In total, it is believed Land Rover has plans to offer literally a dozen of body style configurations. As you may recall, Land Rover stopped making the old-school Defender in January 2016 after 68 years of continuous production. Its replacement is scheduled to come out sometime this year.